The Radioactive Yak: What Does a Magnitude 8.9 Earthquake Look Like? Today Japan was struck by a massive 8.9 magnitude earthquake that caused major damage and loss of life. The quake hit off the coast which resulted in a tsunami which struck towns along the Northern coast of Japan and has resulted in tsunami alerts across the Pacific including as far away as the West coast of the US and Australia. Seismological details on the quake are available from the Japan Meteorological Society and the US Geological Survey. Aljazeera are streaming live coverage on YouTube. In very real terms, these pictures from The Atlantic show exactly what an 8.9 magnitude earthquake looks like. My thoughts go out to everyone affected. A magnitude of 8.9 is big. Very big. The Richter scale is logarithmic, meaning an increment each whole number increase in magnitude represents a tenfold increase in measured amplitude. In real terms, that makes today's earthquake in Japan is around 500 times more powerful than the 6.3 magnitude quake that devastated Christchurch in New Zealand last month. The following visualizations are screen captures from my Earthquake Android app. They attempt to give an idea of the scale (relative and otherwise) of the earthquake in Japan. They are approximate, using only the magnitude of the quake to determine the areas likely to be affected. Additional factors like depth of quake, fault lines, mountains, and landscape can significantly change the areas affected. In the image below, the giant outer circle represents the area within which people were likely to have "felt something"during the quake. That's the better part of a hemisphere reaching as far as Brisbane in Australia and touching Alaska. 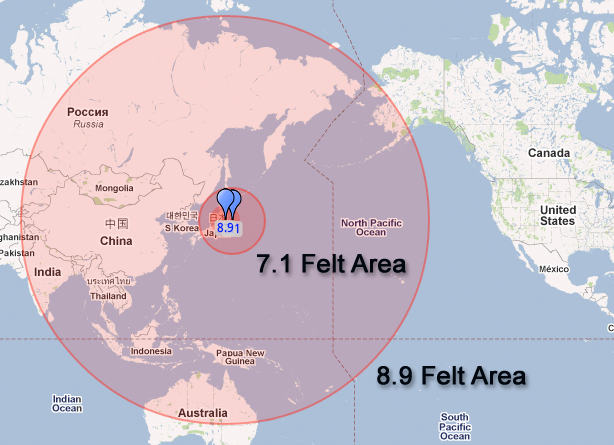 By comparison, the smaller inner circle is the same "felt" area for a 7.1 magnitude aftershock. This next image represents the area at significant risk of suffering from structural damage due to the quake. 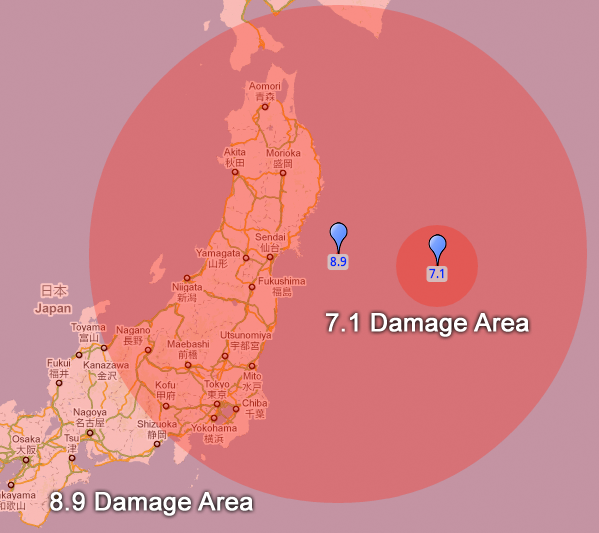 Again, the larger circle represents the initial 8.9 magnitude quake and covers around three quarters of Japan - an area that represents most of the US West coast. For comparison, the smaller circle centered around the 7.1 marker is the damage radius for the smaller aftershock. Just as striking is the aftershocks that inevitably follow such a significant quake. The following image shows only the aftershocks measuring above 6 ("Strong: Can be destructive in areas up to about 160 kilometers") on the Richter Scale. The overlapping areas all occurred within two hours of each other and give a sense of just how terrifying it must be for the people affected. My hopes and best wishes go out to everyone affected by this catastrophe. If you are trying to draw constant distance curve, you should use a formula to calculate constant distance over the sphere. For example you could use the Vincenty's formula using a fixed starting point and range and step through the 360 degrees around it. Understood. I've simplified the drawing of the circles on the mobile app (from which these screen grabs were taken) to optimize performance. As such for an earthquake of this magnitude they have significant error. Hopefully it still gives an indication of the relative power of this quake. 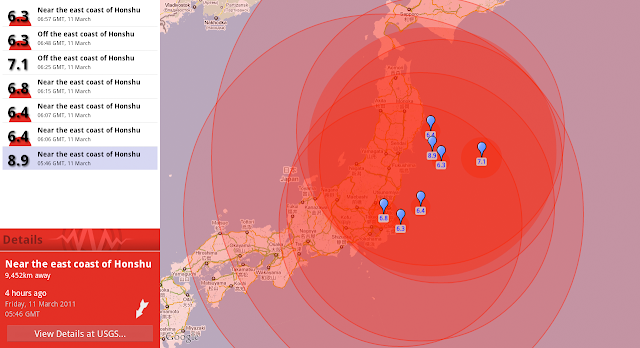 I have a partially working site (http://liveearthquakes.appspot.com/) that shows a more accurate distances, but the site is flaky.